Cycling down TV Access Rd on top of Greater Shepparton's highest point, Mt Major. Greater Shepparton offers cycling enthusiasts and pedestrians a variety of paths and routes to explore. Whether you are seeking a leisurely ride for the family, a scenic bush walk or the ultimate off-road experience, Greater Shepparton has it all. 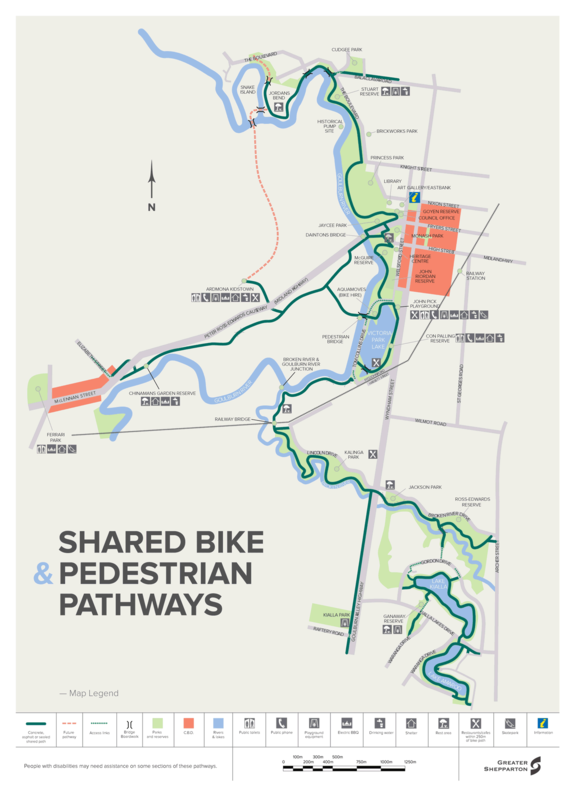 The shared pathway network winds its way from the north of Shepparton, at Water's Reserve, South along the Goulburn River to the centre of the City, and branches West to Mooroopna and south to Kialla Lakes. The pathways run through areas of natural beauty, including forest and river environments, and is connected in places by on road access links. 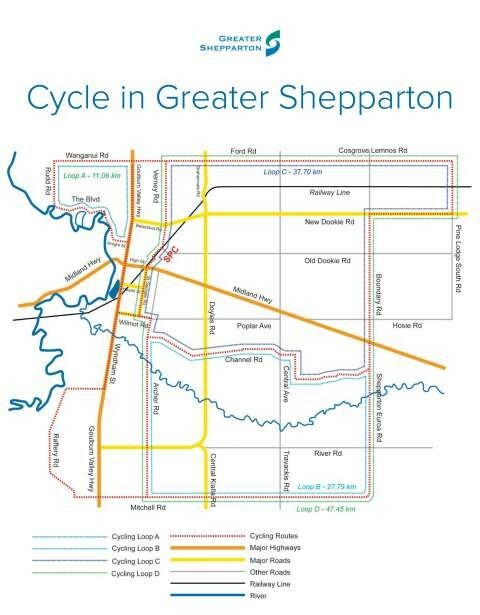 A cycling guide to Greater Shepparton, including cycling routes from 20km to 80km, and the Yahna Gurti Shared Path Network. A walking guide to Greater Shepparton, including the Yahna Gurti Shared Path Network. The Shepparton Fruit Loop ride is a 50km, 100km and 180km cycle ride around Shepparton. The event is held in September every year. It is a challenging event, but not a race. No places are recorded and no trophies are presented. The 50km & 100km rides are over flat terrain while the 180km event includes a 14 km climb through the Strathbogie Ranges. More information can be found on the Fruit Loop Ride website or their Facebook Page. BUG Shepparton are a keen bunch of cyclists from central Victoria who meet together for the enjoyment, exercise and adventure of regular, friendly organised recreational bicycle rides. To plan and actively participate in a range of organised bicycle rides. To provide a forum for cyclists to meet and discuss cycling matters in a friendly and supportive manner. To work closely with local authorities within the municipality to establish and/or improve safe cycling conditions. To promote the benefits of all types of cycling throughout the region. Greater Shepparton BUG believes that cycling is convenient, non-polluting, healthy and should be regarded as a normal activity for people to do for everyday travel and pleasure. More information can be found on the Shepparton Bicycle User Group website. This map shows a number of training loops available in the Shepparton area. Greater Shepparton provides a cycle training route that takes in some of Greater Shepparton's best terrain. Being relatively flat, Greater Shepparton allows riders of all fitness levels the opportunity to extensively explore the region. The Greater Shepparton Cycling Strategy sets the direction for cycling in Greater Shepparton and incorporates the vision for the next ten years. The strategy provides a framework and vision for a cycling network that illustrates existing and future facilities. An action plan is proposed to enable these facilities to be implemented. The strategy action plan is all about setting the basis for delivering the proposed bicycle network and supports sports/tourism cycling facility development. This strategy contains a number of recommendations to guide the Hume Region Significant Tracks and Trails Committee when promoting tourism potential and to seek funding and resources to develop, enhance and upgrade regionally significant tracks and trails in the Hume region. The strategy links to and complements a wide range of local, municipal and state-wide strategies, and is a blueprint for the Hume region in relation to the development and enhancement of tracks and trails over the next ten years.